In accordance with the UK Data Protection Act 1998, The Go-Godalming Association takes the security of data very seriously and has strict policies in place relating to the storage and disclosure of information. A limited amount of information is used in the normal operation of this site in order to provide the user with a better user experience. See the section below on Cookies for more information. As a result of changes in the Data protection law which came into effect on 25th May 2018, we have requested all officers of the Go Godalming Association to allow us to hold and process personal data and to contact them and their member organisations to keep them informed about news, events and activities. Data is securely stored in a locked cabinet, or computer with password security. 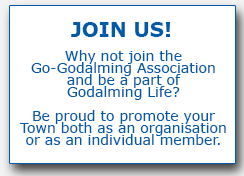 The Go-Godalming Association does not sell, or divulge personal information to others. All processing of personal data will cease once an officer has withdrawn consent, other than where this is required by law, but this will not affect any personal data that has already been processed prior to that point.